While I have been known to write other types of science fiction, there’s something about space opera that keeps drawing me back. In terms of reading, I guess you could call it my first and truest love. As a youngster, I discovered Brian Earnshaw’s books about the tramp freighter Dragonfall 5 and her crew, and Hugh Walters’ UNEXA series about an international team of astronauts. As I got older, I read everything the local library had by Arthur C. Clarke, Robert Heinlein and Larry Niven. Much later, I fell in love with the ‘New Space Opera’ boom of the 1990s, especially Iain M. Banks’ ‘Culture’ books, and novels by Alastair Reynolds, Vernor Vinge and M. John Harrison. I discovered older books by Samuel Delany and Alfred Bester. And recently, I’ve been awed by Ann Leckie’s Ancillary Justice trilogy, and books by Yoon Ha Lee, Adrian Tchaikovsky, James SA Corey and Becky Chambers. But what is it that keeps bringing me back to the subgenre? What is it that appeals to me about these tales of exploration and conflict among distant stars? 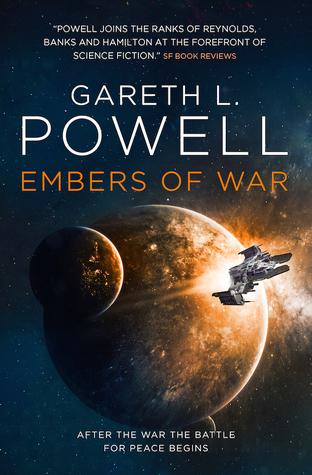 When I sat down to write my latest novel, Embers of War, I decided to throw in everything I loved about space opera. There’s a sentient starship with ideas of her own; a jaded captain with a traumatic past; a tough-talking space marine and a multi-limbed alien engineer. There are ancient alien ruins and bizarre twists of physics, and hints of something lurking in the mists of hyperspace. At its best, space opera contrasts the personal with the cosmic. Human characters struggle against the backdrops of infinite space and deep time, wrestling to uncover the reasons why we’re here and what it all means. It gives us a vast canvas on which to make our points. As storytellers, we’re no longer confined to one world or one society. If we want to say something meaningful about the world of today, we can let our tales leap from culture to culture, shining a light on our real-life existence by showcasing worlds that are very different in almost every respect. Iain M. Banks was a master at this. In novels such as The Player of Games and Consider Phlebas, he creates opposing political systems in order to show what happens when they collide. And he manages to do it through the medium of engrossing stories about engaging and fallibility human characters. But there’s a lot more to space opera than simply holding a mirror up to reality. There’s also the same sense of romance you find in novels about pirates—that sense of freedom and adventure. The idea that all you need is a stout ship and a star to sail her by. My grandfather joined the merchant marine because he loved tales of the sea, and the unexplored corners of the globe. These days, we have to look a little further afield to find that same sense of venturing into the unknown. Where once sailors would weave tales of distant lands whose inhabitants had four arms, or no heads and faces on their stomachs, now we have to set our sights on other worlds, around other suns. The Earth has grown too small to accommodate the wildness of our imaginations, and journey times too short to truly satisfy our wanderlust. There’s an escapist edge to space opera that’s always appealed to me. Maybe I identified too strongly with Han Solo as a child, or maybe it was all those hours playing the Traveller RPG, but there’s something about the beaten-up old starship and its roguish captain that pulls me in every time. Maybe what really appeals is the sense that in space opera, we’re all masters of our own destiny. We’re not bound by anything, save the need to keep our ship flying and stay one step ahead of our enemies and creditors. We go where we want and we do what we have to in order to survive. And we’ve seen things you people wouldn’t believe. We’ve left footprints in the multi-coloured sands of a thousand deserts. Our faces have been tanned by the light of stars so far from here their light won’t reach this part of space for another hundred years. And we’re still questing outwards, still searching for adventure—for an alien invasion to repel or a repressive regime to overthrow. And, at the end of the day, we get to sit in our ships and look out the windows at the cold, distant stars and somehow make our peace with our place in the unending wonder of it all.